Steven Henry, who runs a Ringgold, Ga.-area construction business that mainly builds homes, stands outside the Peerless Woolen Mills that he bought Thursday for $125,000 at auction. Photo by Tim Omarzu /Times Free Press. Standing at a lectern, Sam Furrow, chairman and principal auctioneer at Furrow Auction Company, conducts Thursday's auction outside the old Peerless Woolen Mills in Rossville. The old Peerless Woolen Mills building in the heart of Rossville was sold at auction Thursday afternoon for $125,000. That's about 12 and a half cents per square foot for the 1-million-square-foot complex, which has been idle for years, or $4,630 per acre for the 27-acre site. The winning bidder was Steven Henry, who runs a Ringgold, Ga., construction business that mainly builds homes. Henry also is chairman of the Catoosa County Commission. Henry — who said he was surprised to be the high bidder — doesn't yet know what he'll do with the old mill that employed some 3,000 people in its heyday around World War II. "It's a beautiful piece of history," he said. "One thing I've always thought about is doing a retirement home or a community here." Sam Furrow, chairman and principal auctioneer at Furrow Auction Co., warned bidders of problems with the property, including potential asbestos and lead paint. 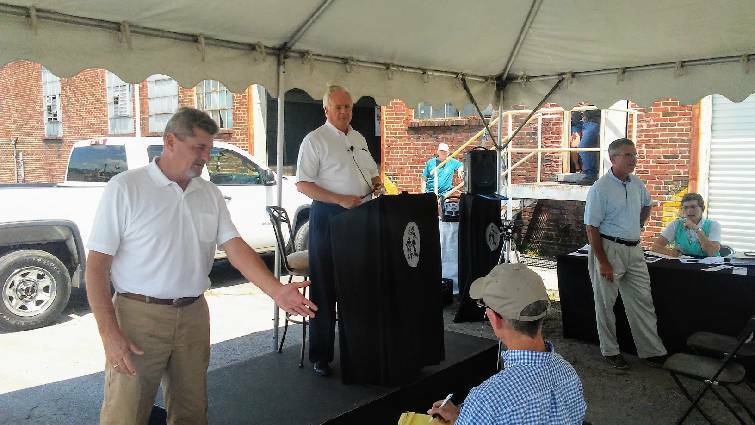 "We have not done environmentals," said Furrow, who conducted the auction underneath a shade tent at the mill. "That may be lead paint in there." City of Rossville officials want the new owner to install fire sprinklers, he said, and to stop storm water at the mill site from overflowing the city's sewer system. "It's either got to be fixed up or it's got to be torn down," Furrow told the bidders as the auction began. He had good news, too, for bidders, including that Praters Flooring, a business that makes hardwood floors for homes, gyms and arenas, wanted to stay as a rent-paying tenant. However, it would cost about $42,000 to install a "dry" sprinkler system for the section of the old mill used by Praters, Furrow said. Bidding was brisk, including people who participated via the internet. Furrow touted the mill site as having "27 acres right here in downtown." 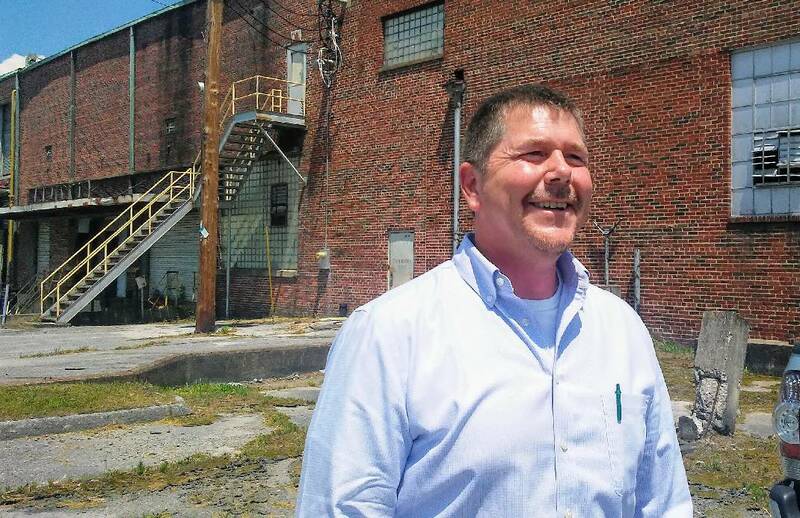 He promised the mill's sale would be the start of a new era in Rossville and Furrow tried to egg bidders on with a quote that he attributed to George Washington: "Where there's no vision, people perish." The sellers are family members who are related to the mill's founders, Furrow said. Among those who watched the auction were Elizabeth Wells, an economic development consultant to the city of Rossville. She thinks the mill site could have mixed-use development with high-density housing, green spaces and public parks. Wells, who has an office in Rossville's City Hall, wants the struggling city to make a comeback. "My family's from here," said Wells. "The thing about Rossville is, it's been a city that's seen disinvestment over four decades." Contact staff writer Tim Omarzu at tomarzu@timesfreepress.com or www.facebook.com/MeetsFor Business or on Twitter @meetfor business or 423-757-6651.